USDJPY is chiefly under the influence of Final Manufacturing PMI in Japan and FOMC Meeting Minutes and Total Vehicle Sales reports in the US. The support rests at 117.730 with resistance at 118.330 which both lines are above the weekly pivot point at 116.940. 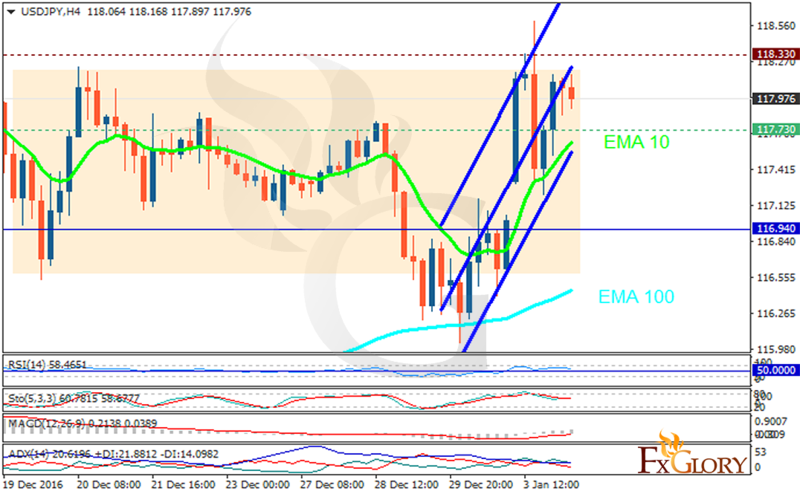 The EMA of 10 is moving with bullish bias and it is located above the EMA of 100 and the EMA of 200. The RSI is falling towards the 50 level, the Stochastic is moving horizontally in neutral rate and the MACD indicator is in positive territory. The ADX is showing buy signal. USDJPY will continue its growth towards the 119 area.